Baby mammals are invariably cute and winsome. We are quite naturally drawn to them. 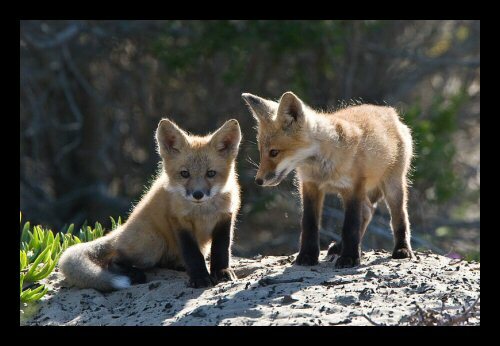 These red fox pups are no different in eliciting that response. They were photographed in a Morro Bay city park which sits right along the edge of the beach, just north of Morro Rock. Like coyotes, red fox have been very successful in adapting to life among humans and civilization. There are at least 45 subspecies of red fox world-wide. A subspecies here in California was thought to have been extinct, but was recently spotted and identified (through DNA testing no less) in the Sierra mountains to the east of Central California. Whether these pups are a native subspecies or one introduced to this country from Europe is for the experts to determine. The problem that wildlife experts have with this particular group of foxes is that they prey upon the endangered snowy plover which nest in the sand dunes nearby. In addition to birds, red fox prefer rodents of just about any flavor. In my experience, it seems that you will more likely see red fox while you are walking or hiking rather than driving. I'm not sure why that would be so, but it's what I have noticed. The "take home message" here is that no matter how cute these or other animals are - they are wild, and should be treated as such. They aren't pets or domesticated. If you happen to see a pup wandering around, most likely its mother has not abandoned it and she will catch up with it. You experienced mothers understand this. Don't attempt to catch it or take it with you.